Moon Enterprises, Inc., supplying machines for cnc industry work. One of the largest companies in the world supplying mechanical and computerized machines to the wire industry, Moon Enterprises has both a national and international clientele and has offices in the United States, Shanghai, China, and Taipei, Taiwan, Mexico City and Syndey, Austrailia. If you are looking for a particular piece of equipment for a specific job, we can help. Specializing in machines for the wire industry, we have one of the largest supplies of new and used spring equipment in the nation, including CNC Spring Coilers, Tandem Vertical Spring Grinders, Vertical Formers, or Box and Conveyor Ovens. Get on our email list to receive a monthly list of "Just Purchased" items. We take trade-ins and also do appraisals of entire plants. 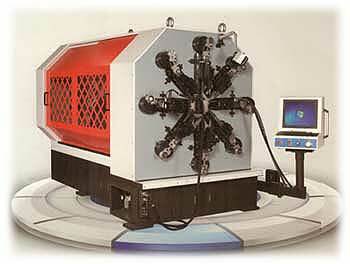 This Moon 1260 Camless CNC Spring Rotating Forming Machine features 12 Axis. with Yaskawa servo Motor and Windows Programming. Wire Diameter is 2.5 to 6 mm (capable of going to 10 mm). This machine is capable of producing numerous types of springs, including tension, torsion, compression, scroll, tower and flat wire.